Electric Tape Dispenser Fully Electronic Control System Automatic dispensing feature with programmable lengths Extra heavy duty, self-oiling blade eLA similar to eSA with keyboard from 12" to 90" with divider key The 555eSA series tape dispenser is a great way to effectively secure packages. The electronic 555e tape dispenser has a fully electronic color coded keyboard control system which is very user friendly. The automatic dispensing feature includes programmable length settings which allows one person to easily do the same amount of work as two. The 555e series is built tough, it is a heavy duty tape dispenser with a self-oiling blade for consistent cutting, which means that this tape dispenser will last. Apart from all these excellent features, the 555e series is able to support the largest tape capacity in the industry with a 1,000 foot roll and up to 10" in diameter, which allows for fewer changeovers and higher productivity. 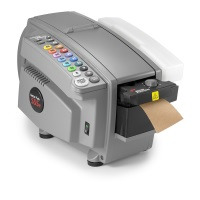 The 555eLA can also dispense 6" to 45" tape lengths (Front Keys) but has a random tape size that allows for the operator to choose the tape length needed for their package . The 555eLA electronic tape dispenser is a great way to quickly and securely seal cartons and packages. Boatman Marking is sure to have the right tape dispenser to fit your individual packaging needs.